There are many directions people decide to take in regards to what type of website they would like to build. eCommerce websites is another way that people can build out a website. Unfortunately, there are people who abuse a system. What abuse can do is cause ethical eCommerce store owners to lose customers. We as consumers should report these unethical stores. It not only helps the online small business owners, but it helps us all stay safe on the Internet. A friend of mine told me that they saw some really inexpensive items online. He wanted me to check it out because he wasn’t sure if he was getting a great deal or getting scammed. When I looked at the website that my friend was referring to, I was very leery because everything on that website cost the exact same price. I know for a fact that not every item will have the same value whether it is furniture or an inexpensive toy. When I first saw all the listings I thought the person who listed the prices did it by creating some kind of code. I decided to do some digging to see what came out of my research so here it is. Wow, Are There Really Sales That Low, Lol? Most likely NO. People who open any store are in business to make money not lose money. How would a store make money when products are sold at a ridiculously low price. If any items are sold with a low price tag there should be a reason behind it. The best reason I could come up with is if there was some sort of very expensive shipping that would cause the price tag to increase once a person checked out. As I kept researching there were red flags that just kept gleaming. Aside from the really low price, free shipping is an enticing way for people to check out what is offered. We all know that free shipping is great because when it’s time to check out, your total will not increase. That doesn’t mean that free shipping is a red flag, but if the price tag is really on the cheap end, you should have your guard up. If you don’t see a sales tax, that is another red flag. Most likely they are out to get your money and not send you a product. Research the website that you landed on. If you read many complaints about the website, more than likely it’s a fraud website. Look up how long their website has been online. 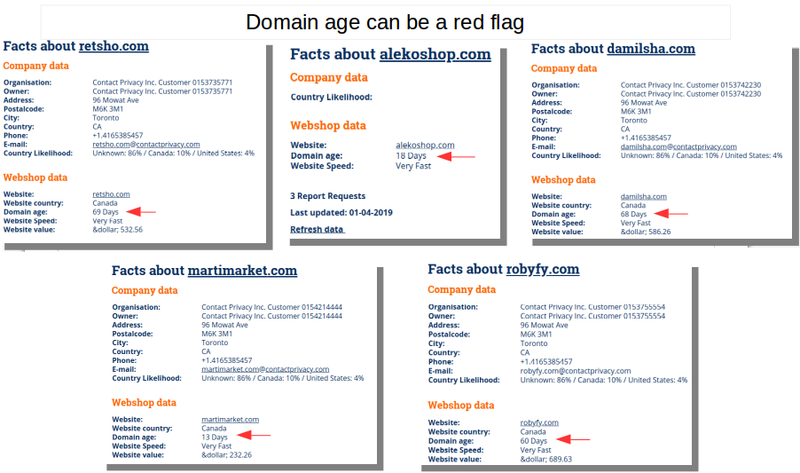 If it is a fairly new website, it doesn’t mean it’s a scam however if the other red flags that I just stated, then I personally would move on. Each website may have a unique red flag such as a very odd way of paying like cash or on the particular website I was looking at all the prices were the same. The website that my friend referred me to is damilsha.com. As I was doing research, I found other similar websites. The list of websites that I researched. The ones that are listed above I noticed were Shopify websites. If you are unfamiliar with Shopify, what Shopify does is allow a way for people to start an eCommerce website easily. NO. Being that it’s a service that offers a platform to easily set up an eCommerce store, unfortunately, scams are going to take advantage of the opportunity. More than likely, Shopify will take down their shop, but in the meantime, it is up to you as the consumer to do your research. I decided to see what I could find about these eCommerce sites. On Reddit, they said super sketchy that a desktop 3D printer for $14.95. On Shopify Forum they broke it down. Those listed above, are just some of the major info that should help you decide to if you’re able to get a 3D printer for practically nothing. There wasn’t much data about this site. Maybe it is because it is only 13 days old whereas damlisha has been in business a little longer. Trustpilot has 16 reviews. The star rate is one star. I’m sure if they can give it a zero they would. The first review said that they hold a string of multiple scam sites. From the complaints I read, it appears it coincided with what I researched. There wasn’t much about their website it could be just like martimarket because it is only 18 days old. Just like Robyfy, Trustpilot also has complaints about their website. One of the biggest concerns is that the website is fairly new. People lose a lot of money because of methodical schemes taking place online. There is plenty of scams going on within any spectrum of the online world. I get it that scammers may not care about the consequences that occur when they decide to plan their schemes. However, it affects us all. The small business owner who may want to sell their own personal products may have a tougher time obtaining customers because people may only go to trusted sources to buy. People don’t have to abuse other people to make money online. There are many ethical ways to build businesses online. The beauty of the online world is that there is room for all of us to do it. People can sell products through an eCommerce store and through an affiliate website where website owners can recommend products and services to their readers. Either way, it takes work, but through hard work, people are building lucrative businesses online without ever having to scheme people out of their money. If you thought you were getting a deal with one of those scheme eCommerce websites and want to know what you can do to try and get your money back or file a complaint I have some tips here. Your first resolution is to try and contact the website owner and see if you are able to get your money back. 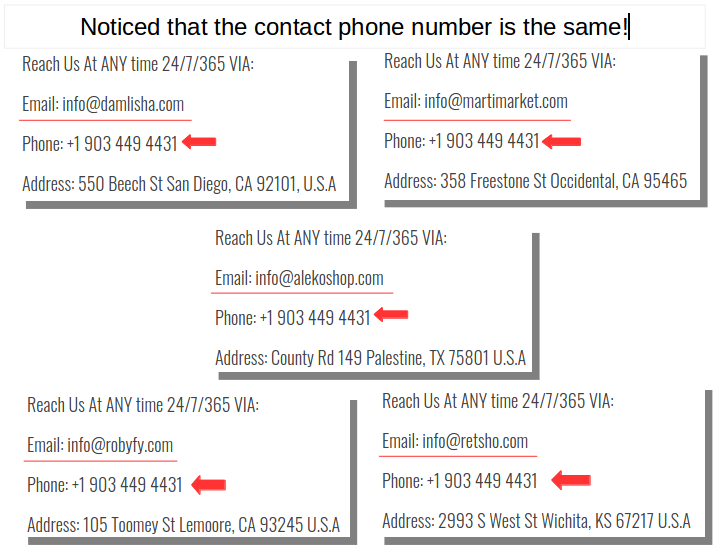 You may get it resolved there, but the Admin or Admins who created their websites doesn’t seem to have accurate contact details. I know that attempt may be a waste of time, but it shows that you tried to get it resolved with no avail. If you paid by credit card, your credit card company might be able to assist you. You can also call your bank and ask if you are able to reverse the charges. Under Shopify rules, they suggest that you contact the website Admin where you purchased the product or products. If you can’t get anywhere within 30 days, you can report them to Shopify. Shopify will notify the website owner, but they will not give you any details about their investigation. 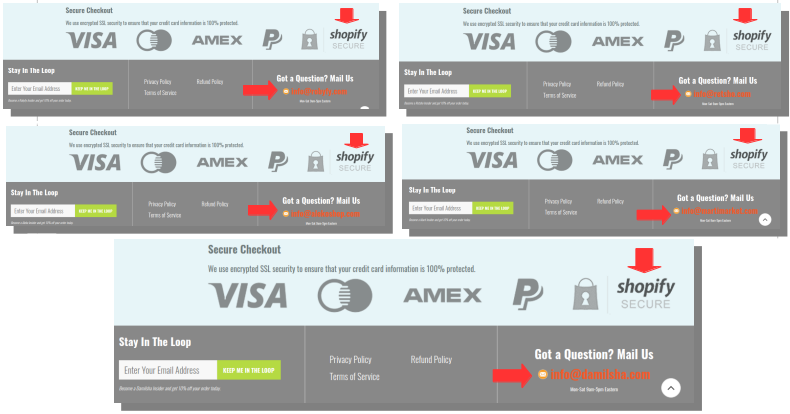 Also, Shopify may contact you to obtain further details, but that is as far that it goes by contacting Shopify. Being that this site is very shady and seems to have some sort of scam ring going on, I’d take matters with the BBB and file a complaint there. You may also want to consider the FTC. The FTC may file an investigation and may even prevent the Admin from opening another eCommerce site. No one wants to get duped out of their money. It’s very important not to give your info out even though the cost wouldn’t do a lot of damage. There are many ways that people can make money from home that doesn’t have to scheme people out of their money. Affiliate marketing is one of the best ways because you can help people by recommending ethical products and services to people. If you do see an awesome low price tag, your best bet before you place your credit info on any site you’re unfamiliar with is to do your research. Go to a site like Scamadviser and look up the date that the website was created before you decide. Read concerns on the net about the website before you decide to purchase. Call their contact info and see if you can get a hold of someone, if you can’t you may have a tough time obtaining a refund. If you have any questions or comments about eCommerce store scams, please feel free to let me know below, thanks! Wow, thanks for the valuable information. These website really mislead you in making the wrong choices. Thank you. Hi Evelyn, thanks for penning down this review. I keep on hammering it both to friends and family members or even newbies in the internet world the importance of carrying out research before getting any product from the internet. It is necessary because any purchase on the internet is not done face to face, it is a virtual world hence the need to do proper investigation before purchasing any items especially those ones with ridiculous low price. I can understand it if it is established online stores, but random ecommerce stores, no way. Your review is a life saver for anyone that is opportune to read it. It is quite unfortunate that scam is upgrading with alarming speed on daily basis. Hey Gracen, I agree that these scams are getting more sophisticated as everyone catches on. A good thing for people to understand is that some scams have twist, however when you breakdown the scheme, it’s usually an old scheme. Like you said research is key and people should do that it will save people a lot of money and headaches. Thanks for your thoughts, Evelyn. Wow, this is scary! I’m always on the lookout for scams, but I’ve never encountered anything this overt. I have seen a few shops with different names that have virtually the same exact inventory, though, and it’s been weird enough to scare me off–but the ones I’m referring to at least had different prices. Thank you for the informative post. I especially appreciated the parts about what to do if you do fall prey to a scam. From experience I can say Paypal is usually pretty good about refunding money if you don’t receive your product as well. So, what do you think would have happened if your friend had bought from this place? No item would ever arrive? Hey Tina, doesn’t seem like a indolent way to just list the prices at the same, Lol. As for my friend, I’m pretty sure my friend wouldn’t have received anything. I don’t know if there were other scheme intent that these Admin had plan such as, identity theft or unauthorized charges…! 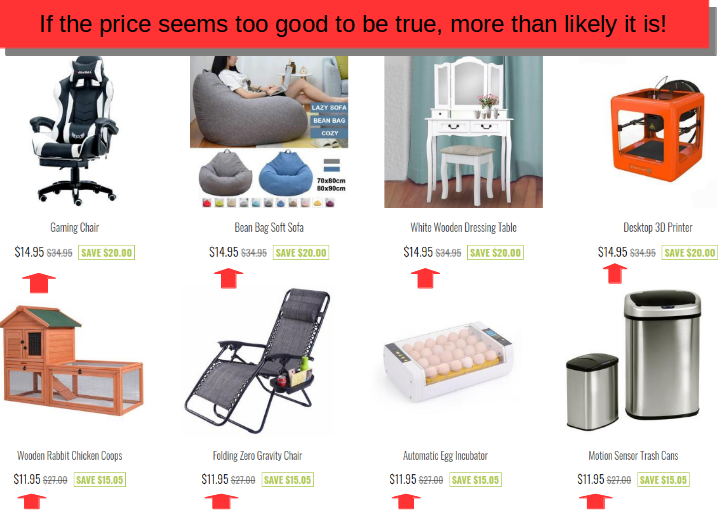 I feel that people should be very careful when they see a deal that is too good to be true. Great question and thanks for your thoughts, Evelyn. 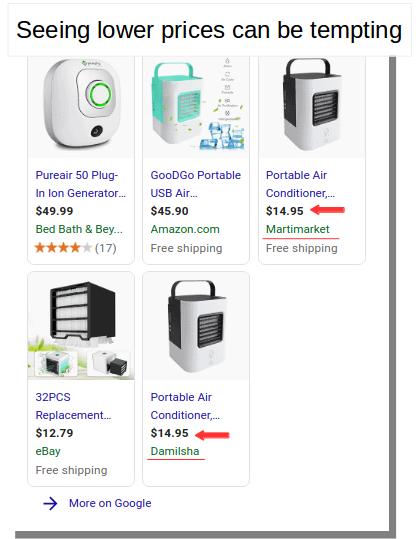 I am always skeptical and at alert when I see a website selling items at a ridiculous low price, always turns out to be scam. I really wouldn’t want to go through all the money back hassle, so I stay away from unprofessional websites. I also use scam advisor a lot, to check the viability of most websites before making any financial commitments. So far, it has kept me safe shopping online. Hey Louis great advice, also, you don’t want to give a lot of your personal details to a site that has abusive malicious intent in the first place. You don’t know what they are going to try and do with your info. Thanks for sharing, Blessings, Evelyn. Hey Alex, I could see people falling for something like this especially if they are looking for a deal and it is a specific item. It is very important that people carefully decide where they shop online because of such abuse online, thanks again for sharing your thoughts, Evelyn. Hey Ola, with so may scams out there, if you’re going to shop online, I would suggest looking at the date the website was created along with actual people recommendations either nay or yeah. thanks for your thoughts, Evelyn.